How to calculate magnetic field around a wire? This magnetic field of straight current-carrying wire calculator makes it easy to describe magnetic field produced by a long and straight current-carrying wire. Read on to understand the basics of this phenomena and find out how can you estimate the strength of this field. 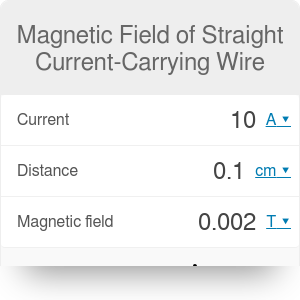 Make sure to check our electromagnetic force on straight current-carrying wire calculator too! Did you know that electricity is always strictly linked to magnetism? It is the result of one of Maxwell's equations which says that flowing electric current produces a magnetic field. Let us consider the case of a long straight wire which carries an electric current. In this particular situation, magnetic field lines form concentric circles around the cable and the strength of magnetic field depends on the distance from the wire and the current flowing through it. We can also wind a wire tightly in a thin coil forming solenoid. To learn more about solenoid try our solenoids magnetic field calculator. You can see that the higher current flowing through the wire and the closer we are to the wire the stronger produced magnetic field is. The Earth and the other planets and stars in our universe act like huge magnets. The Earth's magnetic field originates in its core, where very hot electrically conducting fluids are. The motion of these fluids generates a flowing current just like in the wire which is then responsible for producing the magnetic field. The mean magnitude of Earth's magnetic field is changing over the years, but presently it equals about 5 * 10^(-5) T. Although this is a tiny field, we can still see it on the compass. Let's use our calculator to estimate a current which must flow in a straight wire to obtain Earth's magnetic field at a distance of 1 cm from the wire. It seems after calculations that we need only 2.5 A to keep up with Earth's magnetic field! Magnetic Field of Straight Current-Carrying Wire can be embedded on your website to enrich the content you wrote and make it easier for your visitors to understand your message.